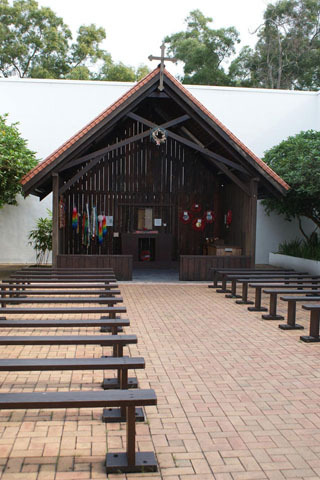 Singapore’s infamous Changi POW Prison was demolished long ago, but this museum and replica of the prison chapel serve as a reminder of the suffering during World War II and the Japanese occupation. The u-shaped museum may be small but it does an outstanding job taking visitors through the effect World War II had on Singapore, While many museums tend to focus on the British and other allied soldiers, this museum does well to profile how everyday life for Singaporeans changed with the Japanese invasion. Old photos, POW diaries and relics like "banana money" are displayed in the air-con gallery alongside a salvaged chunk of the original prison wall. Each bay also displays quotes from people of the day. Sometimes soldiers (on either side) other times from civilians caught up in the period. Also on display is the Changi quilt and murals — inspirational art created by POWs during their imprisonment — which can be seen inside the chapel. While the final wing contains a giftshop with a solid selection of books pertaining to the period for sale, along with some historical prints and other souvenirs. While Changi Museum and Chapel are quite out of the way, if you have an interest in the World War II period, a visit here is close to essential. There is no SMRT station near the museum, but Bus 2 & 29 drive right by. You can get #2 bus from Tanah Merah SMRT or #29 from Tampines. Both buses continue on to Changi Village and the pier to Pulau Ubin, so a visit to both makes sense. If you’re travelling by taxi from downtown, expect the ride to cost around $15. Admission to the museum is free.